Scientists at the American Geophysical Union meeting were told yesterday that the city's street grid is skewed about 3 degrees counterclockwise from "true" north, south, east and west. The tilt began with the oldest thoroughfares, Baltimore, Charles and Calvert streets, and it was carried on by generations of surveyors as they laid out neighborhoods from Edmondson Village to Highlandtown. COMPARATIVE PLAT OF THE ORIGINAL SIXTY ACRES 1729-1905. 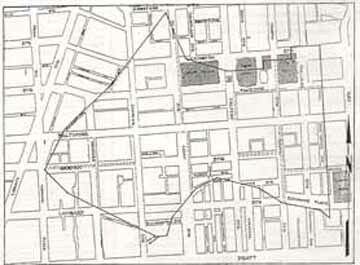 This is an outline of the sixty acre plot surveyed in 1729-30 by P. Jones, Jr., shown overlaying downtown Baltimore's streets as they appeared in 1905 - which is essentially how they appear today (1997). North arrow added by HMH. Plot is rotated approximately 3.5º . Map source: Mayor and City Council of Baltimore, First Records of Baltimore Town and Jones' Town 1729-1797, Baltimore, Maryland, 1905. The finger of blame points to Philip Jones Jr., the town's original surveyor, who apparently used only his magnetic compass when he set the grid in 1730. He failed to correct the readings to eliminate known differences between magnetic north and true north. The scientific community got the news from amateur astronomer Herman M. Heyn, and his research drew, well, no television anchormen and no debate at all. That's not surprising at a scientific meeting where scientists made international news with announcement that thousands of house-sized snowballs are falling toward Earth every day. His own little discovery is "kind of hokey," Heyn said. "It's not going to change anybody's life." But he's proud of it, saying, "It's the first real science I've ever done." It was one of those rare occasions when a nonscientist has had the courage to submit an original piece of research to a respected scientific meeting -- and win acceptance. Heyn, 66, is best known to Fells Point and Harborplace visitors as the "Street-Corner Astronomer" who has given many of them their first telescopic look at a planet, the moon or an eclipse. Trained at Coppin State College to be a high school science teacher, he spent his working life as a laboratory technician, an office manager and a salesman. Now retired, he supplements his income with his street-corner astronomy and, most recently, with sales of his photographs of comets Hyakutake and Hale-Bopp. Ron Zwickl, a physicist and chairman of the American Geophysical Union meeting, said it was unusual for a nonscientist to submit a paper to the union for review. But "an amateur, if he's doing something germane and it makes sense, can get it accepted." Heyn's work -- including maps, drawings and diagrams -- was delivered as a "poster presentation," a format in which scores of scientists mount their findings on posters in a large room and discuss them with anyone who happens by. The astronomical community owes a debt of gratitude to sidewalk astronomers like John Dobson [San Francisco’s street-corner astronomer and inventor of the Dobson telescope mount] and Herman Heyn. Their efforts have produced a corps of amateur astronomers who otherwise might have never become involved in the hobby. And with the Internet connecting us like never before, we can reach out to those who’ve been infected by the astronomy bug and create a true global community of astronomy enthusiasts. For many years, long-time Waverly resident Herman Heyn has been sharing his knowledge of the night sky and his astronomical telescope with the public in downtown Baltimore. On weather permitting nights, "Baltimore's Street Corner Astronomer" can be found on the square in Fells Point (site of this picture). However, he hopes to do a session or two for his Waverly neighbors later this spring or summer. Herman can also be found at the first-Tuesday-of-the month Waverly Improvement Association meetings (he is WIA treasurer) and other community activities. Recently he has been an active fund raiser for our Firehouse #31 refurbishing effort. Star Gazer Comet Hale-Bopp brings a bonanza for Herman Heyn, who has been peddling the night sky for years. bitter. A crowd a dozen thick and growing is huddled around the eastern corner of Thames and Broadway. In the middle is a man in drooping corduroys, black Reeboks and a tattered sweater. Herman Heyn is in his glory. The self-named Street Corner Astronomer, a neighborhood fixture in Fells Point since he first set up his 8-inch Meade Schmidt-Cassegrain telescope a decade ago, is basking in the hype of Hale-Bopp, one of the brightest comets to streak through the sky in recent history. On this particular evening, it is a mere 123 million miles from Earth -- the closest it will come. And it's coinciding with a separate celestial phenomenon, a lunar eclipse. But Hale-Bopp is the star of the night: a tight bright ball with a fan-shaped tail, looking exactly as one imagines a comet to look. It has become a media darling, receiving saturation coverage in newspapers and on television. "It's like my own billion-dollar publicity campaign," says Heyn, who suggests a contribution of $1 for a look through his prized possession. Sometimes he and his telescope stand outside, idle for hours, usually he has to sell himself by calling out his trademark "Have a look!" But tonight Heyn barely has time to assemble his telescope before potential stargazers form a line, fishing for singles in their wallets. Public interest in Hale-Bopp is translating to a boom in business. Everyone, it seems, wants a piece of the heavens. "It's something I can tell friends at parties or like playing trivia. I saw the comet," says Alex McNamee, a Fells Point reveler waiting for his peek through the telescope. Heyn repeats the answers over and over. "I think of it like Broadway. Those actors have to get on stage every night and say the same things over and over. I'm like that, I don't get tired of it. I like it," Heyn says, his voice a bit raspy from hours of chatter. What's it like ... to be a street corner astronomer? Herman Heyn, 77, is a street corner astronomer. He’s tentatively been credited with identifying a previously unnamed asterism – a pattern created by bright stars and a subset of a larger constellation. At an age when most people are retiring, Herman Heyn, 77, discovered his calling. "I had many different jobs, never had a career in one, though," Heyn said. "I worked in sales, as a lab technician, at Pratt Library two years through a 'Great Society' program of Lyndon Johnson's that trained local people to work in public venues. "The longest job I ever had was 12 years as a office manager and truck driver for a small construction company." 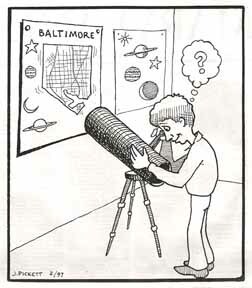 But if you go to Baltimore's Inner Harbor on a clear night this fall, you'll likely find the spry, gray-bearded "street corner astronomer" pointing out Jupiter's moons, Mars, or the rings around Saturn to wide-eyed children, tourists, and, once, to an MIT planetary scientist. "I got interested in astronomy at Garrison Junior High in Northwest Baltimore -- Mrs. Wicker's eighth-grade general science class," Heyn said. "She drew the Big Dipper on the blackboard and told us that night to go look for it in the sky. And I did. I did my homework and I was hooked." "After the war, when you could start buying those kind of things again, I leaned on my father until he bought me a 3-inch refracting telescope," he said. Heyn, who lives in the Baltimore rowhouse neighborhood of Waverly, eventually earned a degree in elementary education from Coppin State and tried classroom teaching, but wasn't successful. "I could never remember students' names," he said, still slightly embarrassed by the admission. "And to be a good teacher, you have to remember the kids' names." Astronomy remained a back yard hobby for a long time, but later he began taking public astronomy demonstrations to schools and local groups. Heyn recounted his story as he pulled his 42-pound, metallic-blue telescope, purchased in 1981 for $1,300, from a silver trunk. It looked initially like something Homeland Security should be concerned about, but by the time he had it set up on his tripod, curious onlookers began to hover. Jugglers, a singer, break-dancers, a snake handler and a clarinet player competed at Inner Harbor for his $1 suggested donations, yet his line remained filled. "Is it real?" asked Marwa Abdelsadelsaddig, 7, who was visiting Baltimore from Sudan with her family, as she peered at a perfect, tiny, nearly vertical ring looping around Saturn. "Can you see it?" she asked her dad. Then, tugging at him, she asked again, "Is it real?" "She has an atlas at home -- she is very smart, very interested in science and the planets," boasted her father, Mohammed. He and his family had never been to Baltimore and were visiting relatives. He added that he and his daughter had never seen the rest of the solar system, either. "You never know what you are going to see when you travel,' Mohammed Abdelsadelsaddig said. Heyn gave fact sheets about the planets to interested observers and copies of a New York Times story about astronomer Carolyn Porco to awe-struck young girls like Marwa. He maintained a steady banter about the position of the planets, listening and engaging customers in lively dialogue. "It took me a while, but I realized I like being onstage," Heyn said. However, it took a 2-year court fight, launched in 1990, before he was allowed to ply his trade at the Harbor Place. "The Rouse Company is in charge of everything that happens there, even though it is public property," he said, noting the annual spring auditions for performers. "And they didn't want anything to do with me. They didn't know what to make of me." The Maryland Lawyers for the Arts took his case, filing a First Admendment suit on his behalf in federal court. By the end, though, Heyn was representing himself. "When the opportunity finally came, I requested a jury trial and they settled. They gave me $2,000. And a place to work." Now, they waive his audition. Heyn takes his science, not just his act, seriously. He's tentatively been credited with identifying a previously unnamed asterism -- a pattern created by bright stars and a subset of a larger constellation. Heyn's asterism, "Herman's Cross," is a large four-star configuration in the constellation Sagittarius. So far, it's recognized by two websites, including the site of astronomy software company Bisque. Early in his "new" career, in 1994, in the aftermath of the much-anticipated collision of the Shoemaker-Levy Comet into Jupiter, Heyn learned serendipitously that MIT planetary scientist Heidi Hammel, leading the Hubble Space Telescope Team's work nearby the Johns Hopkins' Homewood campus, had snuck a peek through his "street corner" telescope. "I didn't know who she was when she stopped by," Heyn said. "I heard about it later listening to National Public Radio." Hammel told NPR that she and friends had gone to the Inner Harbor for dinner and afterwards, walking near the water, stumbled upon a local fellow showing off the marks the comet had just left on Jupiter from its recent crash. "She said she and her friends got in line and paid a dollar for a look," Heyn recounted. "She called it the most meaningful and memorable experience of the whole thing for her. She said she'd been looking at the digital images and photographs sent back by the Hubble, but that was the first time she actually looked directly at Jupiter and saw the black marks with her own eyes." Not long after the Shoemaker-Levy Comet, Heyn reconnected with his former teacher, Mrs. Wicker, who read an interview he'd done with The (Baltimore) Sun. She was in her 80s and living in a retirement home in Catonsville, and phoned her former student, whom she hadn't seen in 50 years. "I went, visited her and had lunch, and we stayed in contact until she passed away earlier this year at age 93," Heyn counted. "I'm grateful to her. I always told everyone that asked I got my start in astronomy in Mrs. Wicker's eighth-grade class. "It doesn't matter how many thousands of times since that I've looked at Jupiter, Mars, Saturn's rings, the mountains on the moon or the Big Dipper," Heyn said. "They always look beautiful to me." 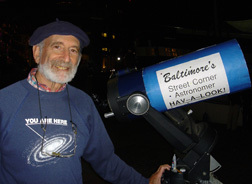 Baltimore's own street-corner astronomer, Herman Heyn, presents "The Stars and Planets of Autumn" tonight at Borders Books & Music in Towson. Heyn earned his title through a long-time amateur interest in astronomy and by haunting the city's sidewalks with his 8-inch Schmidt-Cassegrain telescope. He invites passers-by to peer into the scope and bear witness to the night sky's celestial bodies, including comets, planets, stars and Jupiter's many moons. Tonight's presentation is an all-ages show in which Heyn will feature images he's captured over the years and tell stories about how the sky's scenery changes with the fall season. He's previously given lectures and talks at the Maryland Science Center, which lists him on its Web site as a recommended local astronomy source (www.mdsci.org). SPECIAL TO THE SUN Seeing a cross in the Cuban night I'm not a person who takes a vacation just for the fun of it. That's not to say I don't have fun on my vacations, it's just that I need something extra beside lying on the beach to get me going. I have a big interest in astronomy, so many of my vacations have been staged around chasing solar eclipses. When my old friends and bicycling buddies Jim Pickett and Bill Tashlick invited me to join them on a 600-mile bicycling tour of Cuba, aside from exclaiming, "Cuba!" On a corner in Waverly, Herman Heyn holds a party. It is nothing short of otherworldly. IT'S DUSK in Waverly and we are gathered in a parking lot behind the 7-Eleven on East 33rd Street, peering into the southeastern sky for the spectacle that is Mars up-close-and-personal, a mere 34 million miles away. There are a dozen of us here. We are young and old, male and female, black and white. But mostly we are dopes. Because it's still too light out to spot any planets or stars. So we're basically wasting our time right now. In fact, my greatest fear on this Wednesday evening is that when Mars DOES make its historic appearance -- by now you know this is the closest it's been to Earth in 60,000 years -- I'll see it through the reflection of the Papa John's sign across the street. But this doesn't seem to bother our guru, Herman Heyn, Baltimore's original street-corner astronomer, who is smiling benevolently and setting up his telescope, a thick-barreled Schmidt-Cassegrainian with an 8-inch lens and mirror that look like something they'll report missing from the observatory over at Johns Hopkins in the morning. Heyn has been doing this sort of thing since 1987. In fact, the last time Mars ventured close to us, in 1988, Heyn got so excited he threw a "Mars party" in Fells Point, complete with Irish music and a costume contest won by Miss Solar System. These days, the retired assistant manager for a machinery company sets up his telescope at Harborplace and talks about the heavens with anyone who cares to look and listen. And if they throw a buck in his hat for the look and listen, so much the better. He has had a passion for astronomy, he says, "since Miss Whicker in eighth grade," his science teacher at Garrison Junior High. "She had a unit on astronomy and it turned me on." Next to Heyn, Jerry Feldman from Parkville, another amateur astronomer, has set up his own telescope, a 4 1/2 -inch reflector that is dwarfed by Heyn's instrument. The total effect is like parking a Dodge Neon next to a Cadillac Escalade. But Feldman, an affable man who teaches an adult-education course called "Sidewalk Sky-Watching" at the Community College of Baltimore County, is secure enough not to let the size of his lens bother him. And he seems as equally nutso about his hobby as Heyn does. "I've been observing [Mars] since June," he says. Then, lowering his voice, he confides: "I've been going out around 3:30 or 4 in the morning." 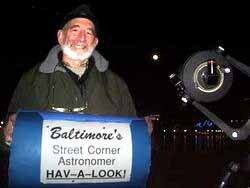 Baltimore's street-corner astronomer is not on a street corner this night. He's at the back entrance of the Rotunda, his telescope trained on the black sky, urging shoppers in a soft, engaging voice. "Would you care to have a look at Saturn and its ring?" says the astronomer, Herman Heyn. "It's that little speck out there." People line up to have a look. "Almost a billion miles away," Heyn says. "As small as it looks, you can put 21 Earths across that ring." Adults marvel, and children are thrilled. "There's no charge to look," says the astronomer, in a voice like the night city sky; you barely notice it, but you know it's there. "But contributions are welcome." Heyn has provided Baltimore its free, or at least cheap, peak at the stars since one November night in 1987 when he first set up his telescope in Fells Point and threw down an old hat. Appreciative people plunked down $10 the first night and $45.70 the next. He's spent three or four nights nearly every week since in Fells Point, Charles Village or at the Rotunda shopping center, his telescope focused usually on Mars, Venus, Jupiter, Saturn or the mountains of the moon. "I'm constantly awed by the beauty of the night sky," he says. "I just love to share these things." Heyn says people this year have dropped about $8,000 into his old straw hat. He's been out about 150 times since Jan. 1 -- slurpy, humid nights, as well as frigid, biting nights -- for an average of five hours a night. He also operates a T-shirt business. "When people ask about my income," he says, "I tell them the telescope's one-third, the T-shirts are one-third, and the third-third is just not spending money." He is 60, slim, bearded, and he remembers his first moment of star-struck awe. "I can pin that down exactly," he says. "It started with Miss Wicker in the seventh grade at Garrison Junior High School. "I can still see her: silver glasses, slightly curly hair, slightly buck teeth -- a really dynamic teacher. One day, Miss Wicker drew the Big Dipper on the blackboard, and I copied it down." That night Herman looked outside. "And there it was, just as she had drawn it," he says. "That was the hook for me." About the same time, he had his first look through a telescope. His father owned Heyn's clothing store at 415 S. Broadway, next to Murphy's, until the 1950s; he occasionally took Herman along on buying trips to New York.